In late 2016, one of NCSU’s teaching greenhouses experienced a baby panda moment, all due to a special flower. Social media went wild and people came from all over to marvel. However, unlike the attractions of a baby panda, this special arrival would only dazzel for 24 hours so the horticultural department had to move quickly to capitalize on their moment. We meet the plant’s owner and learn how weird plants can help us teach others about the awesomeness of our plants. 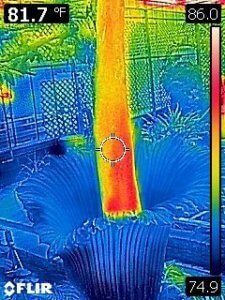 So we recently had a bloom of an Amorphophallus titanium that is the world’s largest flowering species. We named it Lupin. Lupin reached 6’4” and 38” wide. Last fall a special plant bloomed in one of NC State’s greenhouses. It was a baby panda moment. Social media went wild and people came from all around to marvel. The horticulture department realized it was having a moment, but unlike a zoo with a baby panda this special arrival would only bloom for 24 hours so they had to move fast. The plant was an Amorphophallus titanium commonly known as a corpse flower and it’s owner, NC State graduate student Brandon Huber, nicknamed it “Lupin”. This isn’t a story about Lupin. Well not exactly. It’s a story about garden resolutions. But first you need to know what happened. It started for me when I got a message from Dee Shore. I’m Dee Shore. I’m a writer in the college of Agriculture and Life Sciences at NC State University. One of my roles is to work with scientists to help them get their story out to the public through the media. I’ve worked at NC State for about 27 years and this has been absolutely, undoubtedly the most well publicized university event I’ve been a part of. The blooming of Lupin, the Titan arum. Titan arum is owned by Brandon Huber and he had it over in a greenhouse that is used as part of the teaching greenhouses at NC State. The tight, cramped space where not a lot of people can get in. Also, there’s not a lot of parking and that sort of thing. So we were wondering how in the world can we share this with the world. Because we knew it was something special —something that doesn’t happen very often. We thought a live stream would be a great way to get it out. Our videographer here figured out how to work that out. Set it up over in the greenhouse. We ended up with constant viewers. It was placed on a couple of local TV stations —they picked up the livestream and carried it on their webpages. We had viewers from all over the world. At least 10 foreign countries, including Sri Lanka. Most of the folks were from NC but there was broad interest. The horticulture department estimates that over 5,000 people came to see Lupin over a two-day period. At the center of this whirlwind was NC State graduate student Brandon Huber. He’s the owner of Lupin. Lupin originally came from the Huntington Botanical Garden in Huntington CA. The Huntington Botanical Garden is one of the largest collection of cactus and succulent collections in southern CA. It’s located in southern CA, a great environment for growing these plants. The Huntington was one of the first botanical gardens to regularly bloom these corpse flowers. I was visiting some family, close to 10 years ago there. I was visiting them and I have to stop at the Huntington. At the time I was already growing, I was in my teens, I was already growing a lot of crazy plants. I grew another Amorphophallus and I knew Huntington probably had a couple to spare so I asked if I could buy one. Now I was on a behind-the-scenes tour actually because my boss. I worked for the PA Horticulture Society and my boss there knew the curator and so he had got me a behind-the-scenes tour and got me a connection. So I was able to even ask the right person if they had a spare little seedling they could… I remember he said to me, give me a minute I’ll be back. A couple minutes later he comes back with a little bulb in his hand and says here you go. If you can fit this in your luggage it’s yours. When you say little, how little? Probably about golf ball size. A small tuber. So you take this little golf ball size thing home and what do you do with it? So it went back to Philadelphia, my home town. And it actually grew in my work greenhouse there for a number of years and it got bigger and bigger. I just had planted it in a normal pot in the greenhouse and kept it happy, warm, fed it well. And then I was looking to go to grad school and I came up with a tough decision about moving plants —which plants, I may need to unload some plants. Which ones I could move, which ones I could leave with my parents to watch. Well this titanium just had to come with me. Just had to find a spot for it. I contacted the conservatory here —Diane who runs the conservatory. She was happy to allow me to bring the plant here and grow it. They don’t want a lot of pet plants from people. You could imagine it could get a little overkill. Its a display conservatory to feature a diversity of plants and draw the interest in. It found a nice home in the conservatory as a really unique plant. Last year. So its been living here ever since. It was fall of 2014 when I moved it here. When I moved it, it actually was getting pretty big. Fortunately the plant was dormant when I moved it. So I didn’t have to worry about hauling this live, growing plant with me. It was just the bulb. Again, it’s was in the bulb stage when I first moved it. It flew from CA back to Philadelphia and here it was as a lot bigger bulb, a 10 pound bulb. Just in a pot. Just a big bulb sitting in a pot among all my stuff coming down here to Raleigh and potted it up and it broke dormancy shortly after moving here. Then it grew for about 2 years. And then when it went into it’s recent dormancy, this plant has almost an annual cycle where it will send up a leaf and it will go dormant. It will take a month nap or so and then it will send up a new shoot and it will have another leaf, and it will do another leaf. It will just keep doing this until it’s old enough to finally bloom. So on the recent dormancy the bulb weighed 51 pounds. Huge. 16” across and about a foot high. This big huge tuber, so looking at the size of it we had no way of knowing if there was a bud or a leaf coming up. I looked at the stats , some data online. Apparently they are known to bloom if they are above 30 pounds. So I was like, wow we are in the ballpark of where we need to be for a flower. So we might see a flower. So it’s just kind of a waiting game at that point. It sat dormant for about 2 months. And then all of a sudden it started growing. Two months ago it started actively growing again and the shoot started coming up and up. The interesting thing about Amorphophallus titanium is the shoot and bud come up in the same spot and you really don’t know they’re a bud until its about 2’ tall. So we really didn’t know. So the shoot kept developing and it looked a little off to me, it looked a little different. Its never bloomed before, so it looked different. But I couldn’t just say it was a bud because how do I know. I couldn’t just tell everybody. People love seeing these things bloom so I can’t just tell the world it’s blooming and have it not. It did bloom and people came —by the thousands. I was one of those people who lined up to see it. There were lots of people with kids. These weren’t the kids I normally see in public gardens who are running around tearing things up. These kids were mesmerized. Heads back, mouth open, eyes locked on the crazy huge plant that was captivating us all. The spectacle captivated me so my next stop was to visit Bryce Lane. Bryce is a former TV garden show host, sought-after speaker, and Distinguished Undergraduate Professor at NCSU. I asked Bryce what comes out of all of this attention. You say, “Oh my gosh”, it’s a real teachable movement because you’ve got their attention with the bizarre aspect of the plant. How it presents itself. That gives you the opportunity for them to fall in love with plants, beyond just the weird and unusual. Is this the weirdest plant? Oh heavens, no. There are hundreds and hundreds of plants that have unique and interesting stories that if we were to go out of our way to tell those stories we would probably have many more people interested in gardening and plants than we do. The challenge is trying to find, as representatives of horticulture and plants in general, it’s finding those plants that have those unique stories. For example, there’s a tree that’s getting ready to turn bright yellow fall color – Gingko, the Maidenhair tree. The unique story behind that plant — it’s everywhere, it’s an Asian native. Butter yellow fall color. Then in the middle of the fall after all the leaves are completely and totally yellow, for whatever reason one night all the leaves fall. Leaving virtually none on the tree. No other tree in the world does that when it drops its leaves. Maples don’t do that. Oaks don’t do that. But Ginkgo does. If you have that story to tell and you can tell someone about that —“hey look here’s a tree where the leaves all fall the very same night. So when you go to bed one night and the next morning they are carpeting the ground. That’s a pretty cool story that generates a bit of awe if you will. That in and of itself can be what launches somebody’s interest into plants. I’m speaking totally as an educator now. In that I believe that the beginning of learning is romance / awe. Creating a sense of awe is our responsibility as educators. If we can do that than the hard work of learning can be endured. Oh, no question about it. Their awesomeness —if you will is perhaps a little more cloaked or obscure compared to perhaps other living things, like animals that their uniqueness tends to be really in your face. They move, they interact. Plants are much more subtle. So we have to do a better job. My take is we have to do a better job communicating their wonder to people. Be it children all the way up to adults. When you walk outside what do you see? Plants. It’s like, ‘oh yeah, they’re there.’ What about them is so unique? Lots of plants have very unique stories. It’s just finding them and then telling them. That hit home. When I fall in love with a plant I’m willing to learn about it, enduring the failures that will inevitably occur, in my efforts to successfully grow the object of my affection. And then I am compelled to share my joy with others. What gardener has ever just pointed out a plant, saying, “I grew that”? Instead, we tell anyone who will listen all about the plant, why it’s so cool, what we went through to grow it, and why they need to try to cultivate it. We gardeners know that our plants are awesome. Delighting in their stories, we know their secrets—or we think we do. However, all too often, I brush past them as I hurry to my next task, forgetting that others don’t know their awesomeness. 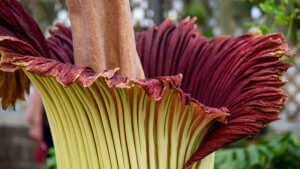 How can we ignore the flower of Amorphophallus titanium, a flower that smells like rotting flesh, is the largest bloom in the world, and is part of a plant that heats up in an effort to attract pollinators? Just as we can’t take our eyes off baby pandas because they are so cute, we gaze at a corpse flower because it is uniquely weird. I realize that my garden plants cannot hold the public’s interest the way baby pandas and Amorphophallus titanium do, they deserve to have their stories told. For me, the plants in my garden inspire much awe. So this year I’m resolving to tell their stories to anyone who will listen. Now, what is your gardening resolution for the coming year?